When one of your favorite mystery authors makes a departure from their regular series, do you follow along? Do you worry about the new characters, and whether you'll be just as happy with the new series? I've been disappointed at times. I've read every one of Robert B. Parker's Spenser books, but I don't care about his characters, Jesse Stone or Sunny Randall. Betty Webb is well-known for her Lena Jones series, and, naturally, since they're set here in Arizona, they are particularly popular here. These are somewhat dark books. Betty herself says that the first one, Desert Noir, sets the tone. So, when she started a new series, a slightly lighter one set in a zoo, readers might have worried a little. There's no need to worry. The Anteater of Death is a stunning debut for the Zoo Mysteries featuring Teddy Bentley. Was Lucy, the anteater, framed? Theodora "Teddy" Bentley was the zookeeper who found a body in the anteater's enclosure at the private Gunn Zoo in California. She worried about her beloved anteater's fate, until she learned Lucy didn't kill the wealthy victim, the husband of one of the Gunn family members. However, she was even more sure that a fellow zookeeper wasn't the killer when Zorah was arrested for the murder. With the sheriff convinced he arrested the killer, Teddy realizes she's the only one who cares enough to find a murderer who is threatening her beloved zoo. The odds are stacked against Teddy. The sheriff is her old boyfriend, Joe Rejas. She and Joe were separated when her socialite mother sent her to boarding school in high school. They both married others, but now they're back in Gunn Landing. She has to fight her attraction to Joe, not only to find a killer, but to protect her zany mother and her scoundrel of a father, a likable con man. She also has to contend with the large, extended Gunn family, and the complications of the Gunn Family Trust, a trust that supports the zoo, but could also doom it. Webb's new mystery is a remarkable book, combining fascinating facts of animal and zoo life with a complicated plot. There's an interesting cast of characters, all with unique traits that animate them. Teddy and her family have a complex relationship that can be amusing, and, for Teddy, frustrating at times. Teddy, and her love of the zoo animals, bring this book to life. Webb's knowledge of zoos and animals shine through in a story that wouldn't be nearly as interesting without the animals. Betty Webb's fans won't be disappointed. She continues to educate readers, this time about zoos and animals. Fans of her Lena Jones series shouldn't hesitate to pick up this mystery. 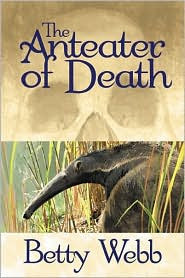 The Anteater of Death is an outstanding traditional mystery. It should bring new readers to Webb's challenging books. Betty Webb's website is www.bettywebb-zoomystery.com. She also blogs at http://bloggingwebb.blogspot.com. Normally I go along for the ride and see what happens. I've been disappointed a few times, but most of the time I'm not. I've got Webb's new zoo mystery on my wish list, so I really appreciated your review, Lesa! You're welcome, Cathy! I hope you like it as well as I did. I know you're not going to be disappointed with this one. 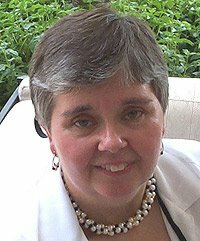 Lesa, What I love about your blog is the unusual. I can always count on reading about something I haven't heard about before. Thanks. Thank you so much, Wisteria! What a nice comment that you can count on me for the unusual. That's really nice. Keep me posted on your Bog Book Buddy Challenge! This one sounds interesting, Lesa. I'm not so much of an animal person, but I'm anxious to try Betty Webb's books. We are going to do DESERT NOIR and DESERT WIVES this coming June in my mystery book group. I think they will enjoy trying her Lena Jones series. It will be great to have another series to share with them at the same time. And, this one might be satisfying for anyone who doesn't like Desert Noir and Desert Wives. Although these aren't as tough reading as Desert Cut. I really liked the cast of characters in The Anteater of Death, Kay. Even if you aren's an animal person. My husband and I are both very active at our zoo as volunteers, so I liked the zoo setting of this book alot. But it was Teddy's screwy family that kept me laughing! You're right, Caryn. Great family to NOT live with, isn't it? Sounds an interesting read Lesa. I wondered if you'd be interested in partcipating in an activity over on my blog called Best Crime Fiction Reads for 2008?